“Look at Me!”Click here to share this image. 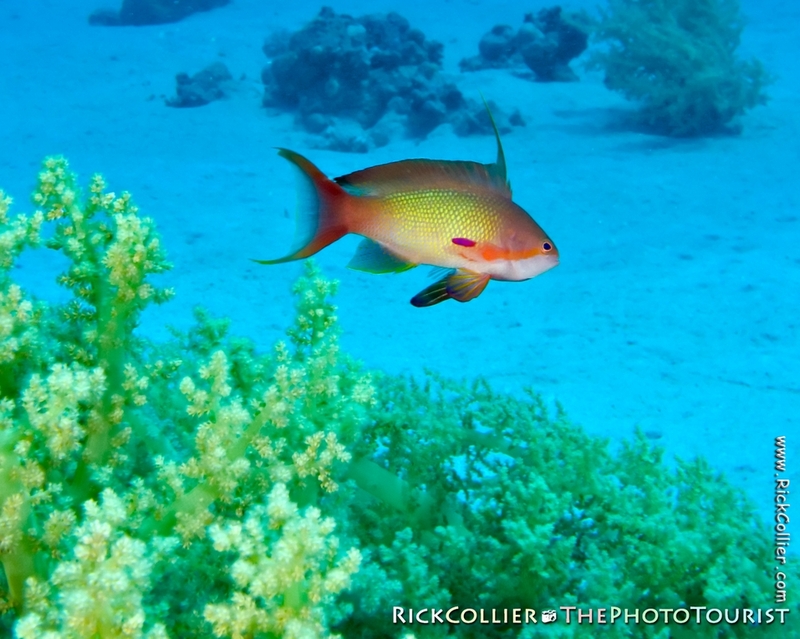 Touring Egypt 22: The scalefin anthea. I finally managed a shot of one of these little beauties. Finally! I had been trying for days and through many, many attempts — most leading to bad photos or serendipitous shots of other species (like my last underwater post). Antheas are everywhere in the Red Sea. Take a picture underwater and you are nearly certain to find some small orange fish somewhere in the frame. You really can’t avoid them. That said, it is amazing how hard I found it to get a picture of just these little fish. Though they are ubiquitous, they are also small and quick — and also apparently tasty to other, larger fish. (Judging from their skittish behavior, they must be prey for just about everything.) Approached directly, they invariably dart away, leaving me with an out-of focus blur or maybe just a little tease of tail at the edge of the frame. Try as I might, I was unable to get close enough to get a really good picture to show their rainbow colors. 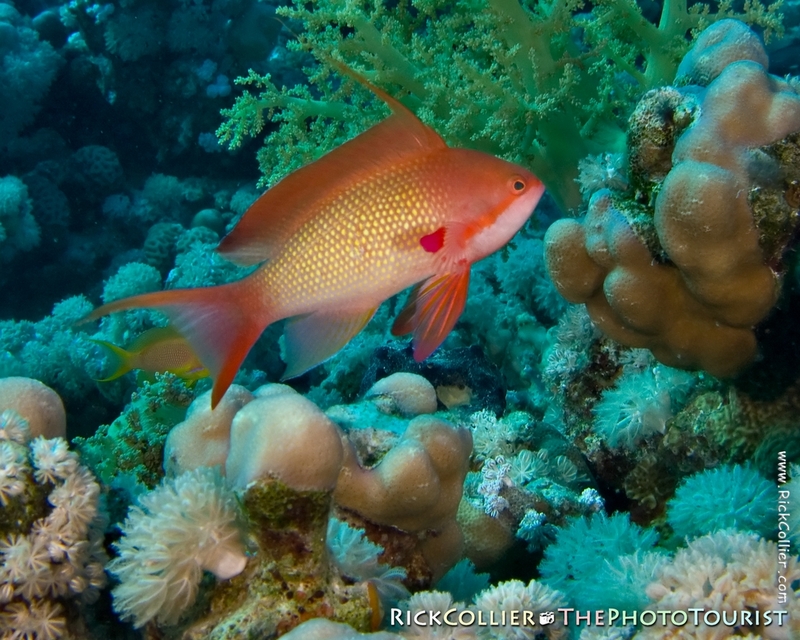 The scalefin anthea is probably my favorite Red Sea fish. From the first time I dove here, I was struck by their fabulous coloration. Though at a distance they appear predominantly orange, when they flit near one can see that they are actually a miniature rainbow with shades of red, pink, purple, orange, and yellow. I love to look at them. I wonder how such a complex color scheme came about in nature. The fact that they are very, very common just means that everybody gets to see them — casual swimmers, snorkelers, and divers alike. I suppose their commonness makes them ordinary to some divers. To me, it makes them all the more special. Another fabulous sight for any visitor to these waters. “Peekaboo”Click here to share this image. This entry was posted on Monday, September 21st, 2009 at 19:43 PM. It is filed under thePhotoTourist, Underwater and tagged with anthea, coral, destination, dive, Egypt, fish, Gazlani, Middle Garden, Ras Gazlani, Ras Mohamed, Ras Muhammad, Red Sea, reef, scalefin anthea, scuba, Sharm el-Sheikh, Underwater. You can follow any responses to this entry through the RSS 2.0 feed.